The turntable tables keep rolling in. Gizmodo has an entry from the Milan Furniture Fair which is beautifully crafted, though for some reason I imagine it surrounded by shag carpeting. Probably just me, but we’ll never know — no link to the designer. For those of you keeping score, that’s Cool Turntable Tables = 4, Cool Computer Tables = 0. Whether you can afford these luxury items (I can’t! 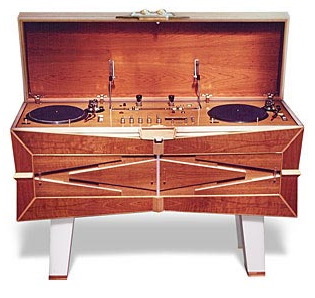 ), designers’ interest in turntables clearly demonstrates a sense of what the object means for music. So why not computers, too? It’s long been my belief that musicianship and stage presence are about the human being, whether they’re using a record player (imagine trying to tell Edison about scratching! ), concert grand piano, jaw harp, whatever — so where are the computers? Have you seen a designer who “gets” the computer as a creative object? Let us know. Update: of course, turntable furniture might make you feel like a star, but not as much as a huge crowd of rock fans you can stick on your wall, as found by Tom at Music Thing.